It has been over a decade since South Korean cinemas produced martial arts action movie, the last ones being Fighter in the Wind (2004) and Arahan (2004). A recent addition to the list, “Revenger” stars Bruce Khan, a former stuntman in his first leading role. 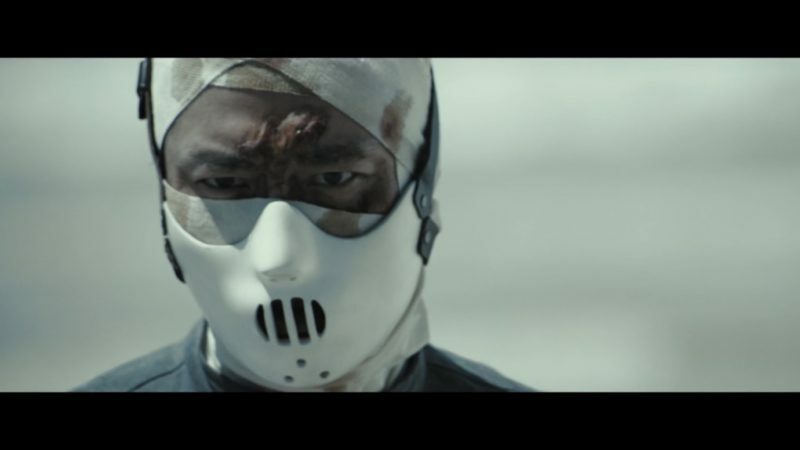 It also marked directorial debut of Lee Seung Won and boasted production from the makers of The Raid movies, as stated from the trailer. Released in December 2018, the movie garnered rating 5.7 stars from 976 votes on IMDB (at the time of writing). Despite a compelling stunt from Bruce Khan, Revenger can’t seem to hit the right notes in terms of engaging story and characters. Note: this review may contain spoilers. A former detective, Yool (Bruce Khan) infiltrates Sura Island to avenge the murder of his family. The isolated island is known as the place for criminals facing death row after committing heinous crimes. With no cops around, somehow the evil Carlos Khun (Park Hee-soon) ruled the island while his henchmen hunt and kill others as they like. Yool becomes involved with a mother and daughter pair, Maly (Yoon Jin-seo) and Jin (Kim Na-yeon) as well as their tribes. “To be killed is the only way out of this island,” as the legend says. True to its title, the plot of “Revenger” movie revolves around a man hunting down the murderer of his family. If he finds the villain too early, there is no doubt he will fight him first, but then story will end too soon. To keep the story interesting, of course he would have no clue about the villain’s whereabouts and had to fight many others before meeting the one he wanted to kill the most. The story started with a mother and daughter pair who were running away from the group of men in AP 101 prisoner uniforms. The mother, Maly, sacrificed herself to delay the bad guys and let her daughter (Jin) escape. However, the gang largely outnumbered both of them and their efforts to fight seem to be futile. Suddenly, a heavy sea wave advances towards the shore. A figure emerges, and the silhouette walks calmly through the shoreline. The man (later introduced as Yool) was searching for Carlos Khun but he gets ridiculed and attacked by the gang. Yool managed to defeat the bad guys, with just front and back kicks as his hands were tied (which just show how badass he is). Jin tells Yool that her injured mother knows where Khun is, but he must help carrying Maly back to their hiding quarters. Soon after, they become entangled with unexpected events and a series of fight ensues. Plot-wise, the director Lee Seung-Won is very clear about the storyline and how he wants to construct it. Rather than pondering about the rating or what the audience would think, he served the story as it is. The purpose is straightforward, for Yool to fulfill his revenge and fight till the end. The narrative would be monotonous if not for some flashbacks explaining how his family was murdered at the first place. On a positive note, there is an opportunity for a prequel should they decide to show the background story. If the whole movie could be considered as a food course, action scenes would be its main course. Action genre enthusiasts would surely enjoy the gripping fighting sequences. Bruce Khan is excellent with the role, as he is quick with bare hand punches, defences and spinning kicks. With his medium height and muscular frame, Khan is not one to be messed with in 1-to-1 or 1 versus many fight scenes. Since one of the screenwriters is Bruce Khan himself, action takes center stage really well. From his resume, apart from working as a stuntman, Khan has written action-oriented screenplays and stunt choreographies behind the scenes. 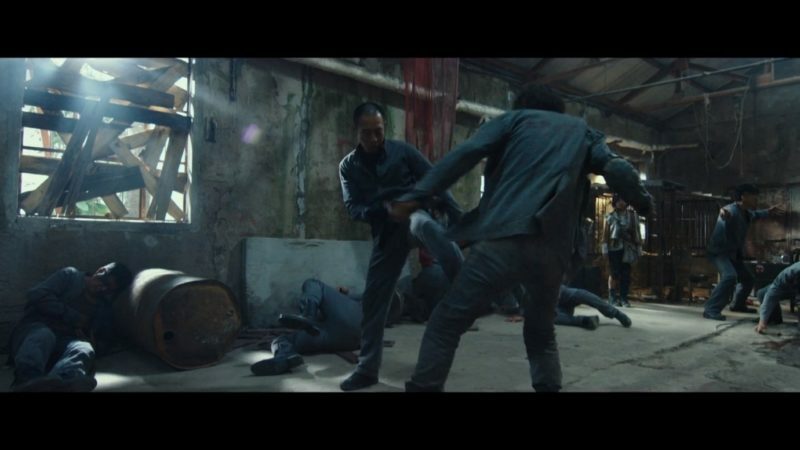 Taking full advantage of Khan’s martial art skills, the camera work consistently captures the elaborate fight choreographies with one of deserving highlights here is the thrilling swordplay. Huge props to both the director and choreographer for the realistic action scenes. Quick reminder though, be prepared for the gore and abundance of bloodshed. Comedy parts of the movie utilized typical Korean situational comedy and language barriers, courtesy of the Captain Bau (Kim In-Kwon) and his team members. Regrettably, while the attempt is noticeable, most of the jokes fell flat. It seems that what might be considered funny for Korean audience may not click with Western or global audience. Nevertheless, some comic relief is necessary to balance the serious tone of the whole movie. Although playing as the lead actor, Khan have so little dialogue that he only has five lines. He barely speaks and keep showing expression of either resentful or anguish. This was understandable with him harboring deep anger towards the villain and troubled with the wrongful death of his wife and daughter. From the list of casts, I am only familiar with Park Hee-soon, whom I have known from thriller movies such as The Client (2011) and The Suspect (2013). However, it takes time for me to realize he was playing the villain Carlos Khun from his overall appearance. Here Khun was shown as a crazy dude, there is no valid reason justifying his actions except that he is a psychopath that enjoys killing and torturing people as his hobby. In the meantime, potential for the supporting characters was wasted with underwritten subplot. Yoon Jin-seo as Maly is admirable in her role as a protective mother who is scared to lose her daughter. 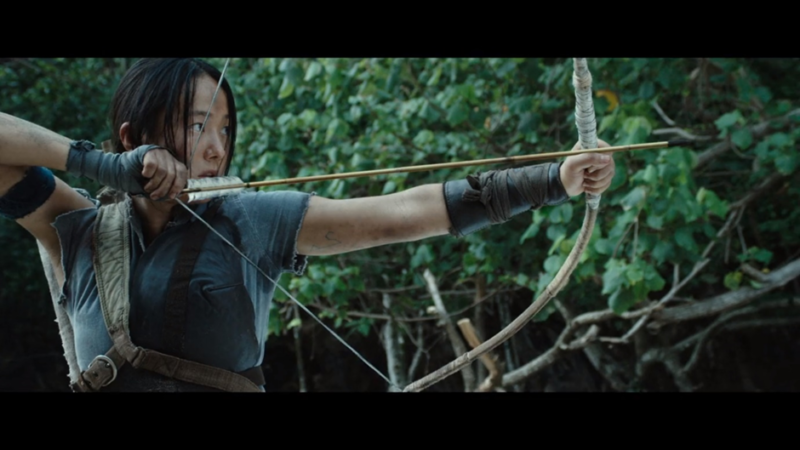 In particular, Maly has her own warrior moments with her impressive archery skills. If there is any character that deserves attention, that would be Jin (Kim na-yeon) who displays multiple facet of a rebellious teenager. Like Yool, she resents Khun for ruthlessly killing her father. Being orphaned at such a young age, she sees father figure in Yool as he repeatedly protects her and Jin reciprocates with care towards Yool’s well-being. Meanwhile, it felt like other additional characters are written either to be knocked out by Yool (if they’re bad) or tortured (good ones) in order to assist the progression of the story. Unfortunately, with majority of the runtime allocated for fight scenes, there would be less room for character growth. To put it simply, the producers chose to showcase stunt skills of the characters rather than putting more effort to develop an engaging story. While my favorite movie genres are drama, action and thriller, it was my first time watching a full-fledged South Korean martial arts action film. Halfway through the movie, “Revenger” reminds me of Kill Bill series (2003-2004) where the badass main lead (Uma Thurman) fights the henchmen hierarchically, one after another before finally facing the mastermind as the climax of the story. After watching, I do have mixed feelings over the film, which would be described as follows. THE GOOD: When I look back, “Revenger” would be most memorable for the fight scenes. Bruce Khan really shows his combat skills as he holds 4 black belts in various Korean martial arts. Indeed, he is the best man for the part. The scene stealer of the movie would be Jin’s character. She managed to make me sympathize and care about her more than the others. Plus, straightforward plot helps me to connect the dots easily. The other thing about “Revenger” worth mentioning is the cinematography. With the tropical island setting, there were beautiful shots of sea, lush forest and even volcanoes. THE BAD: Movie relies too much on fight scenes to keep the audience going, while some comedy parts make me cringe. Another weakness is the spoken language. Sometimes they were conversing in Korean, then English and occasionally Indonesian. Some characters were saying something in broken English and I had to rewind the scenes to understand their speech, thus spoiling the viewing experience. Verdict: Is it worth watching? Martial arts showdown by Bruce Khan as well as strong performances by Yoon Jin-seo and Kim Na-yeon (child actress playing Jin) were the movie’s strong points for me. What held the movie back are the simple storyline, weak supporting characters and overused jokes. I did enjoy “Revenger” and would recommend it to others – just wished for more background stories and better writing to flesh out the characters better. Personally, I would rate Revenger 7.2 stars out of 10. For the martial arts movie follower or anyone interested in action genre, by all means, “Revenger” should be on your viewing list. It is definitely worthwhile just for the impressive fight scenes. Remember to stay tune for added bonus scene before the end credit. On a side note, the production also dedicates their condolences for the family of a stunt actor that unfortunately passed away while filming. It makes you realize the real efforts done in filming action movies, and how they risk their lives for their passion. Have you watched “Revenger”? Drop your comments below if you have anything to share about the movie. This article reflects the opinion of the freelancer. Netflix’s Cargo: Is It Worth Watching?